We had a two and a half hour dinner last night. I came home hungry. Maybe it was baby. Maybe dinner was so long that I got full then hungry again before it finished. Maybe the Thai restaurant we picked, which is usually so good, was off it’s game (Halloween??). Take your pick but I think it was likely a little of each. Either way, it was midnight and I wanted something savory, spicy and garlicky. And quick. I scoured the pantry for something that could check all of the required boxes. What do you make to satisfy late night cravings? I bookmarked this recipe from The Kitchn earlier that day for Sesame-Garlic Soba Noodles with Fried Egg. I’ve raved to you before here, here, and here about my love for the thick, chewy texture of buckwheat soba noodles so I’ll spare you. In case I haven’t mentioned though, they are a great late night or busy evening meal because they cook in 4-5 minutes. Tossed with a scrambled egg, sweet peas, garlic and chili flakes and crunchy sesame seeds, this 10 minute meal was just what I needed to satiate my late night hunger. This recipe can be varied depending on what you have in your refrigerator. It’s not a really recipe that’s meant to be followed to a tee but rather meant to inspire you depending on what you have on hand. If you have time and the ingredients, cubed fried tofu, sauteed onions, mushrooms or sweet corn would be great additions. Even without any of those things, we found this to be a quick, spicy and savory meal. In a small saucepan, bring water to boil then cook the soba noodles according to the package. Drain and transfer to a bowl. In the same saucepan, on medium heat, heat about a tablespoon of oil. Add the garlic and chili flakes and cook for about 3-4 minutes until the garlic is tender and fragrant, stirring frequently. Add the sesame seeds and cook for another minute or so. Reduce the heat to medium low and crack the egg into the pan. Scramble quickly with a wooden spoon and cook for a minute or so until the egg is well done. Add the peas and cook for another minute. Remove from heat and mix in the soy sauce and siracha. Toss the soba noodles back in and season with salt. Eat hot. Wow. That’s easy. I will do it. Oops just a typo – should have been “sesame” seeds. Thanks for catching it! The noodles look yummy ..I love the combo of flavours esp.garlic. ND: Thanks! Garlic, siracha and soy sauce is wonderful in almost anything. Yum. ND: Shirin, hi! Yes, 36 weeks this week so very close. At this rate, if it’s possible, our baby may come out with garlic breath 🙂 Thanks! wow..looks fantastic..and cant believe its that simple..
Wow! lovely click. They looks so delicious. A simple and yummy meal! 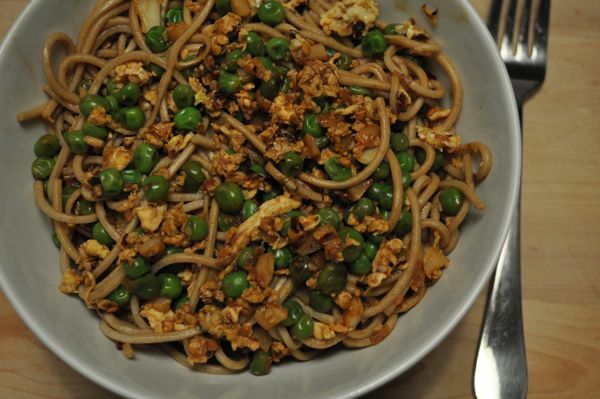 nithya, i saw this recipe when you first put it up a few weeks ago- and came back to look at it for the ingred as i want to prepare it tonight, my husband is v health conscious and wont eat carbs at night, but soba noodles i think he will have. i love the addition of sriracha. we always have a bottle in our fridge, cannot live without it. i look forward to trying this dish tonight.